Day 7: I drove back to Hobart stopping off at Ross on the way. 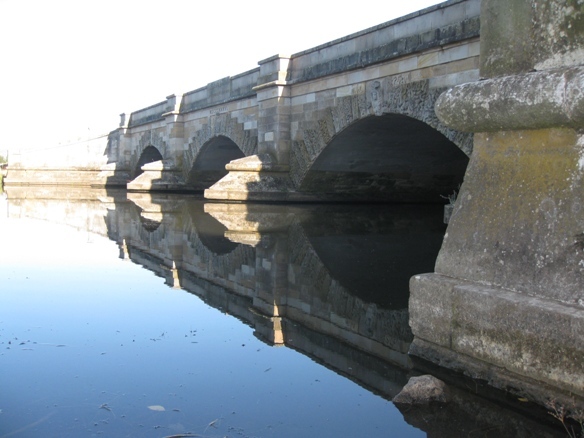 I’d read in my lonely planet that the bridge was the third oldest in Australia and one of its most impressive. I wasn’t blown away. Day 8: I went on a sculpture trail around Battery Point where I learned about the history of Hobart’s waterfront. 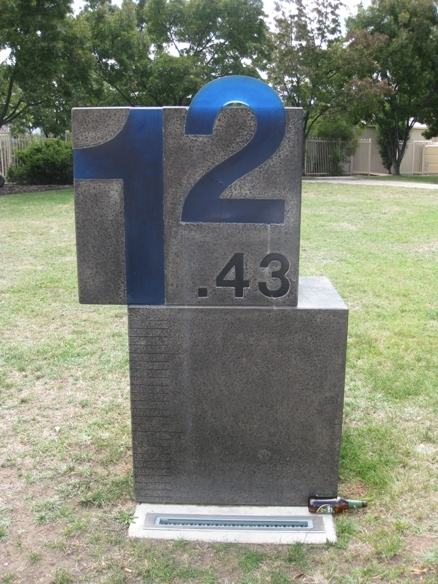 The sculptures took the form of numbers – weights, measures, dates, quantities and distances – that were important in the development of the waterfront and were made of materials that recalled the eras described. It was very thoughtfully done. 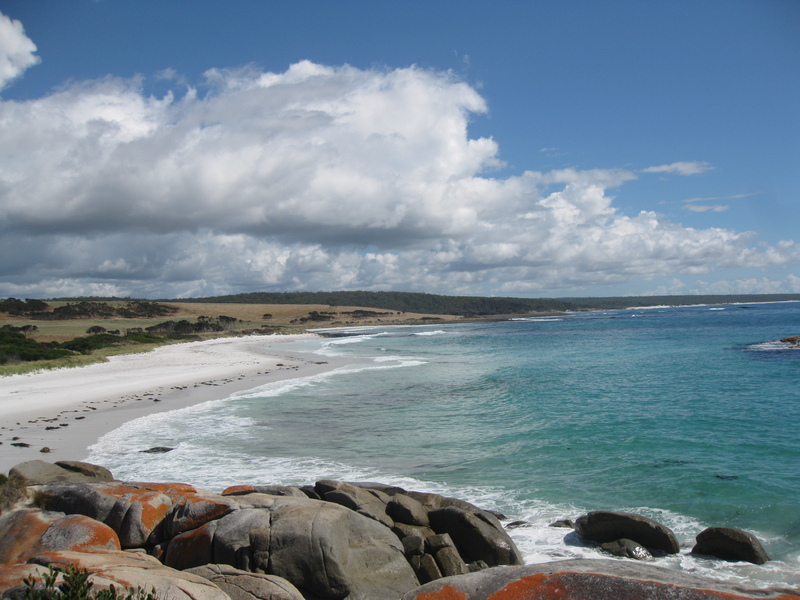 Day 6: We headed up the coast to the Garden on the Bay of Fires. I clambered over some rocks to this beach which I had entirely to myself. I stripped down to my underwear and went for a swim. 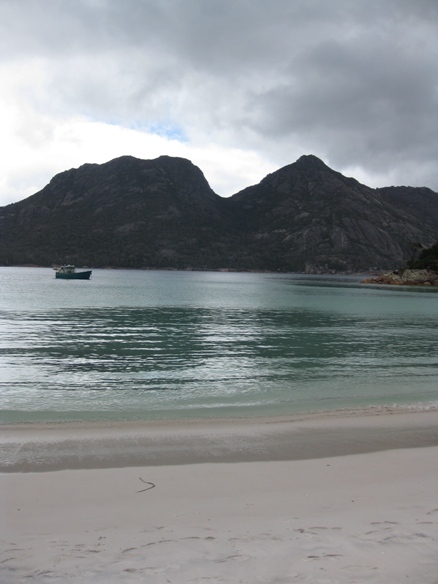 Day 4: On our second day on the Peninsula Circuit we hiked over Mt Graham to Wineglass Bay. We’d been lucky with the weather so far but by the time we reached the bay, dark clouds were gathering overhead. It poured on the last stretch of the walk back to the car park. Day 5: We detoured from the coast road up into St Mary’s and headed to the South Sister Lookout. As we climbed up the rocks to the summit I heard what I thought were pipes playing. 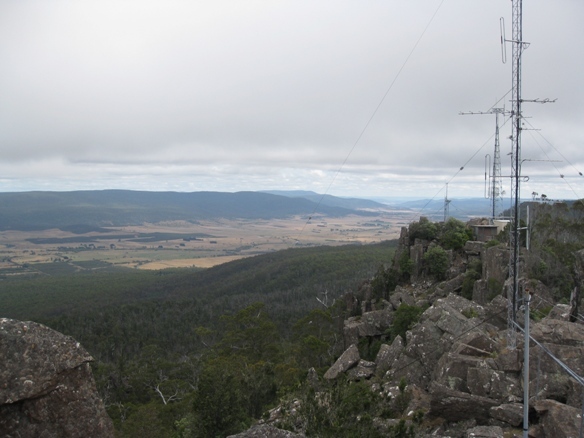 The noise turned out to be a combination of the wind zinging through the telecommunications cables and the high pitched buzz from a radio mast at the top. It was dizzyingly high. 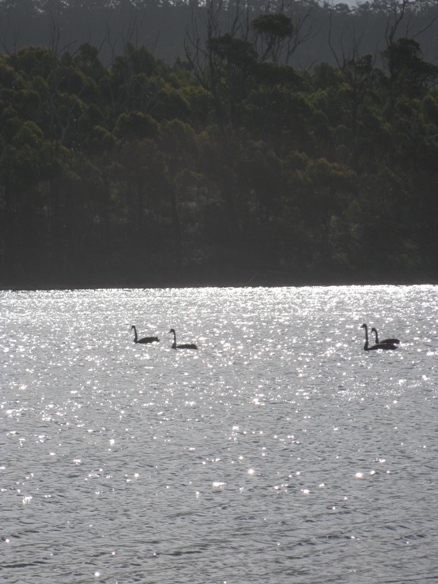 Back on the road to St Helen’s we pulled over to snap some black swans. 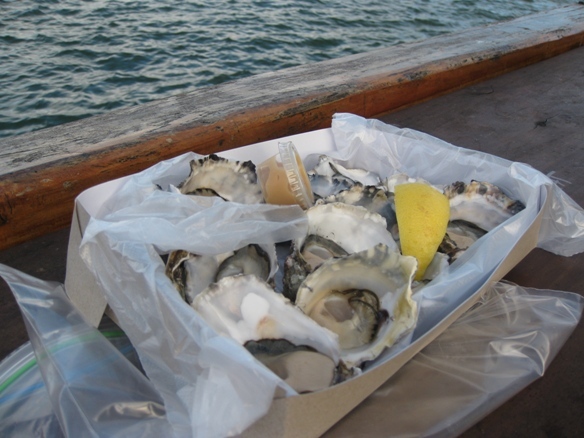 In St Helen’s we treated ourselves to some Tasmanian oysters before heading to a free campsite in Humbug Point. 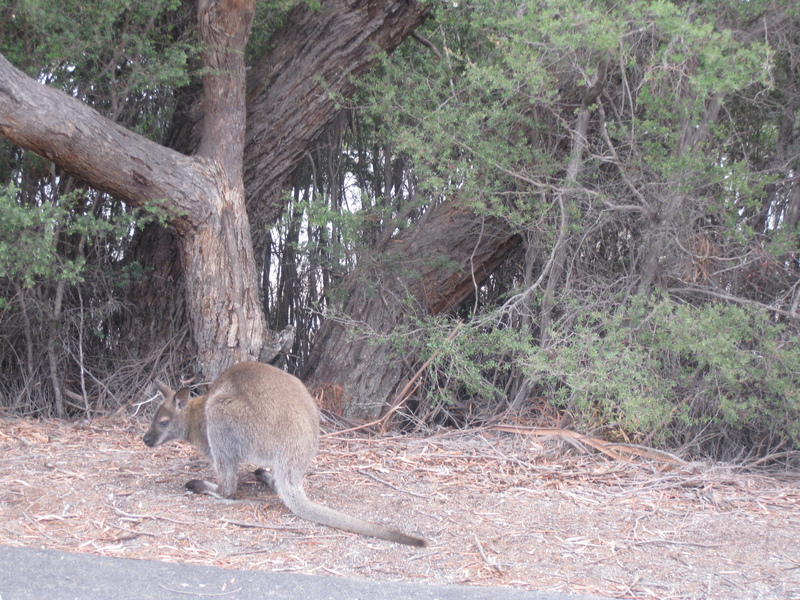 Day 3: Driving up the east coast of Tasmania I frequently had to steer round dead wallabies on the road. We saw plenty of live wallabies at Freycinet National Park which were so used to humans they barely looked up from eating when we walked past. Please universe, may they never end up as road kill. 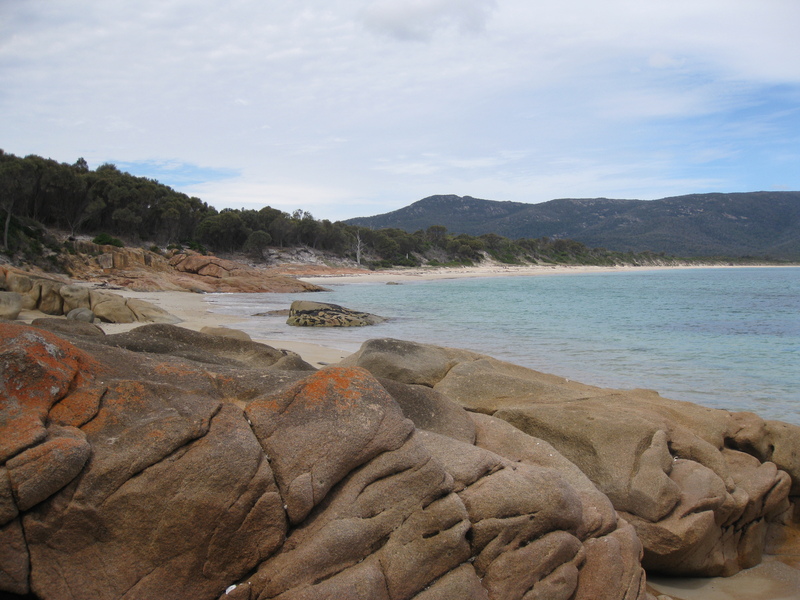 The Peninsula Circuit is a two day hike taking in some of Freycinet's beautiful isolated beaches. It was a challenging walk where we sometimes had to scramble up slippery granite river beds or hoist ourselves over fallen trees. 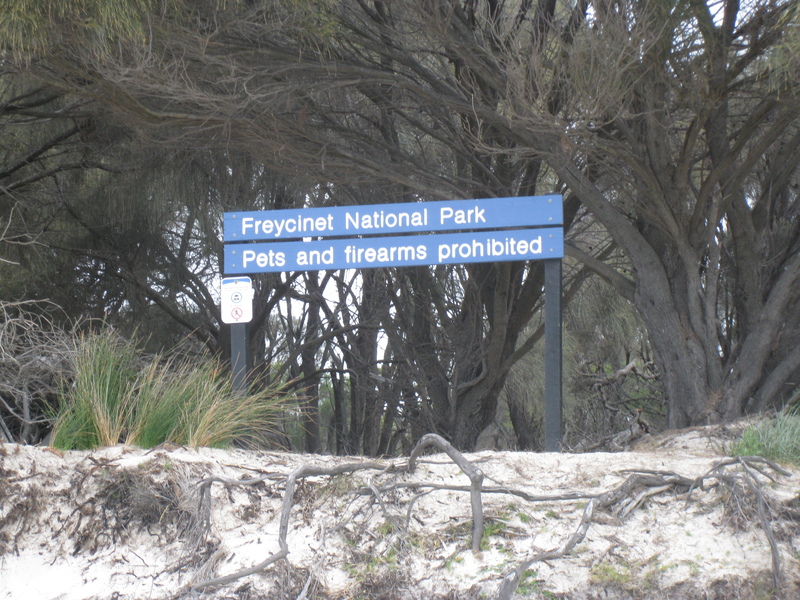 I had to laugh when we reached the campsite and saw this sign. Has anyone ever managed to get that far with a rifle tucked under their arm? Or a poodle for that matter? This is where we set up our tent at Cook's Bay after completing the first part of the Peninsula Circuit. 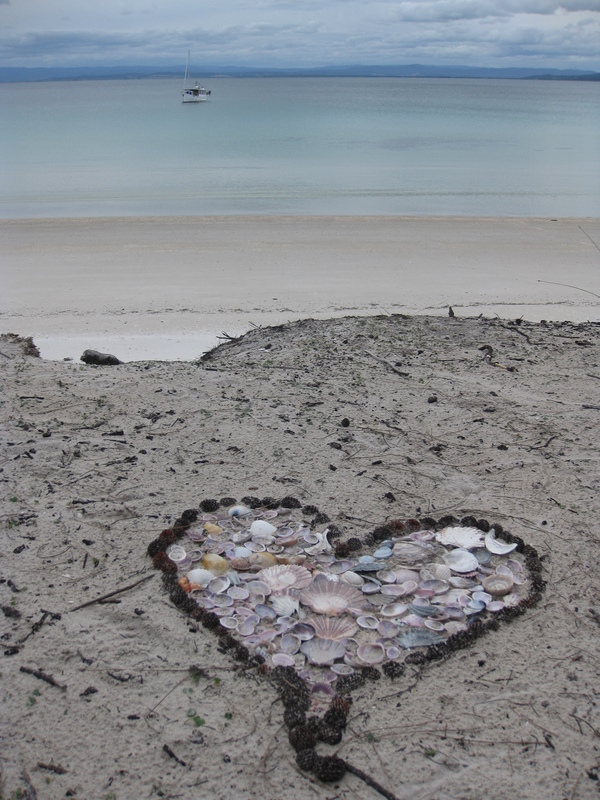 The love heart made of shells was already there when we arrived. I imagined a young couple had camped there before us and sat looking out over the sea as the sun went down. It was definitely a very romantic spot. 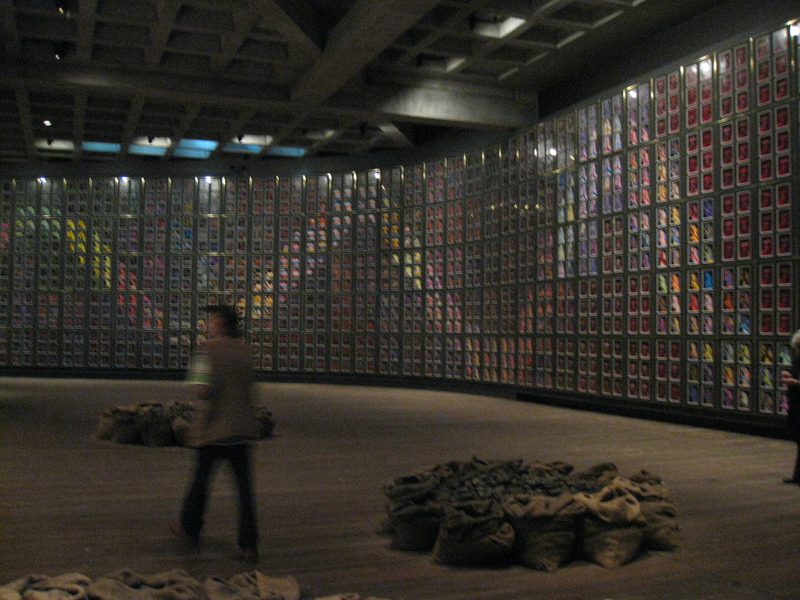 Day 1: In the super high tech Museum of Old and New Art (MONA) in Hobart I saw some disturbing modern art. Works by Wim Delvoye were particularly squirm-inducing. It was great! 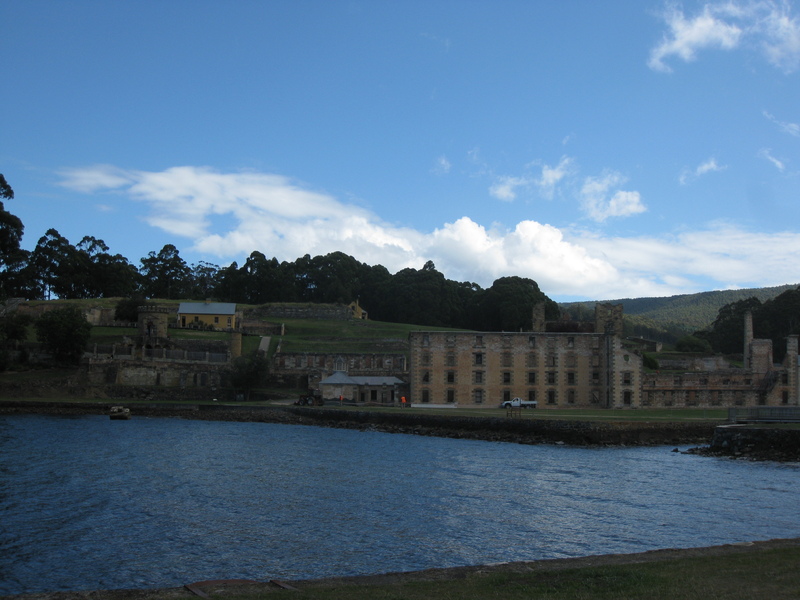 Day 2: After wandering through some of the ruined buildings in Port Arthur, the site of a penal colony renowned for the horrific conditions in which the prisoners were kept, I went for a boat tour round the harbour. The guide pointed out that due south there was nothing but sea until the Antarctica and this might be the furthest south any most of us would ever come in our lifetimes. This got me wondering where is the furthest north I've been in my life? The highest altitude? And how could I depict this in an artwork? It must have been visiting the MONA yesterday that got me thinking that way. On our first night we left the main road and drove down a dirt track in search of a place to camp. We pitched our tent next to an abandoned warehouse with a sign outside saying "Keep Out! Quarantine Area". The corrugated metal panels on the roof clattered in the wind. In the last stretch of daylight we walked to a nearby deserted beach. 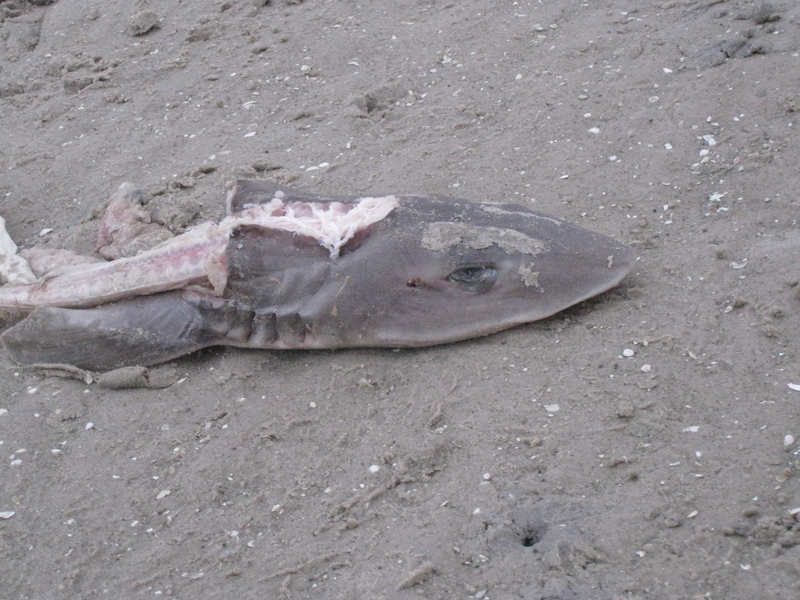 I counted four carcasses of small sharks, the flesh picked from their back bone but the heads still intact. It was an eerie place to be.